Use this operation to create an IL/CL or X/Y horizon from a set of well markers. The operation uses the marker values from enabled wells and optionally interpolates between them. Where is the Create Horizon... operation? Note: The Calculate button is disabled if a horizon is selected in the map view that is waiting for another operation. Complete the previous operation before continuing. Where is the Create Horizon ... operation? The Create Horizon from well markers operation is found in the Map View, under the Operations tab (along with other horizon operations). 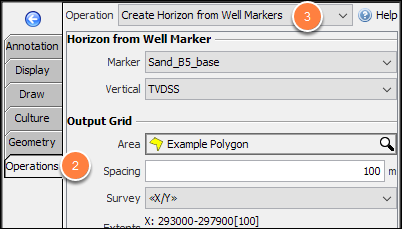 At Operation, select Create Horizon from Well Markers. Review the included wells, available markers and their values in the Well Markers Table. Select the Vertical domain for the resulting horizon. Enable Sparse to create a horizon of points only at the markers (i.e. without interpolation). 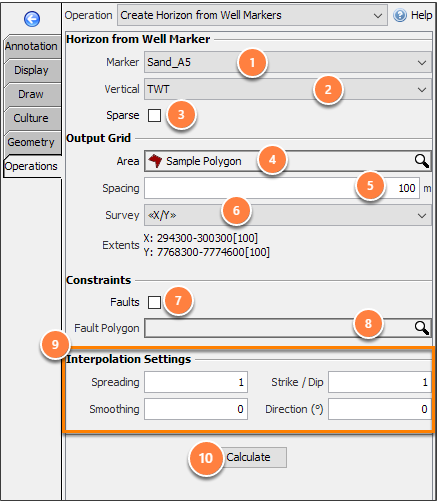 Export a sparse horizon to create a list of X/Y and depth values for a marker across many wells. Markers outside the area are used in the calculation and influence the results. Disable wells in the Control Panel if their values should not be used. At Spacing, enter the increment for the horizon grid. At Survey, select the survey to define the output geometry for the horizon. If a survey is selected, extents are calculated from the selected area and spacing. Insight honours all enabled faults in the Control Panel. Unassigned fault sticks are not used. Fault Polygon: Fault polygons are excluded from the output (if selected).